What is this gap, this cut, this cove? From the river path, I see a trunk sewer, elevated above the ground. Duck under, and a ruined concrete and brick structure. My eyes dance across the surface of broken angles; peer into a rubble-strewn chamber. But soon, I am looking at something more massive. A cliff, dwarfing the ruin and sewer. (Though is massive the correct term? A cliff suggests a lack of mass, a void. But whatever might be appropriate, it is surely a derivative of ‘very big’). The cliff a horseshoe of wall, and trees sparsely fill the flat bottom and lower flanks. Up high, leafless and stunted trees tiptoe on the edge of the golden-in-sunlight rocks. It’s sandstone, I think. Or maybe limestone. The lower cliff faces are shiny wet and pattered in sunlight. 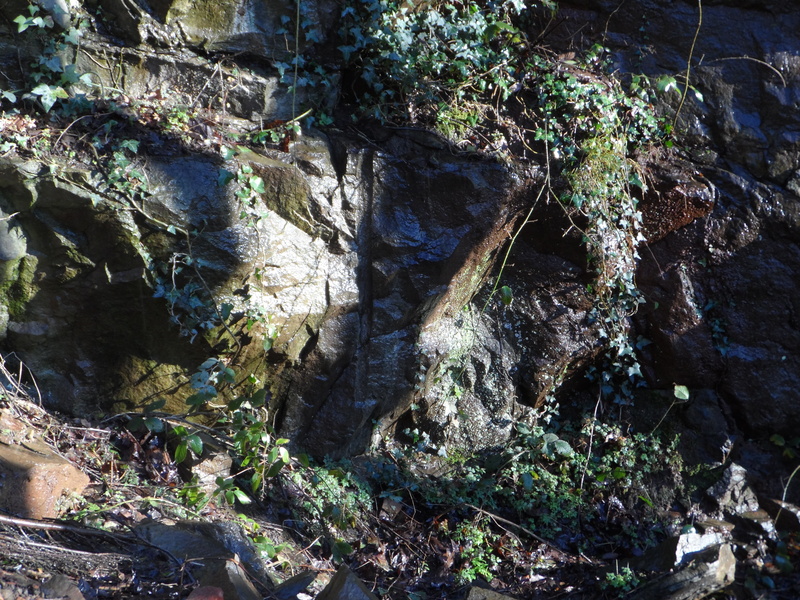 Here the water seeps through the rock’s crevices, and drips off the brambles and ivy. Not quite a din or cacaphony, but an asyncopated collage. I’m at the highest point I can get to from the bottom, and the space is quite a wonder: an amphitheatre of stones and gravel facing a stage empty but for the trees. What happened here? How did this place come to be? I search high up on the cliff faces, looking for prehistoric rock art. A folly practice, in a site near the city in view of the busy river path, but I look all the same. But there is still rock art – the furze of spray paint. The prescence of modern (that is, contemporary) people, or at least, the signs of their prescence, sometimes unnerves me. I can happily lie in a flimsy bivuoac in the thick night while foxes bark and owls screech, but if the thought that I might be discovered by a gang of kids or a gamekeeper crosses my mind, I’ll not be sleeping. Now, seeing this rock art, the narrowmindness of my romantic prehistoric-focused imagination is thrown in to sharp relief. I wonder: what would an archeologist make of this space in two-thousand years? In Don Fernando, W. Somerset Maugham considers that great proto-postmodernist tome Don Quixote and the mention of a meal named duelos y quebrantos, which translates as pains and sorrows. He points out the great scholarly exertion used to find out what this dish might be, for it to be discovered that it’s merely bacon and eggs. He then leaves a quip about bubble and squeak, anticipating the three-hundred years of investigation into what this meal could possibly be. And so to here: as well as the spray paint, there’s a picnic bench and abandoned tent, as well as the concrete ruin and sewer pipe. When this place is buried and then excavated, what conclusions would future thinkers draw with regard to this space? Picnic bench as ceremonial table? Tent as nomadic home left in a hurry? Sewer pipe a sign of Romanesque technology? I scramble back down and it becomes clear that the boulder and scree is not timeless; permanent. There are signs of a recent rockslide. In among this largely plant-free stony debris is a tree with large blocks against its trunk. Other trees lie half buried, their roots rising skyward. Fractures in the rock face portend the next rock fall.